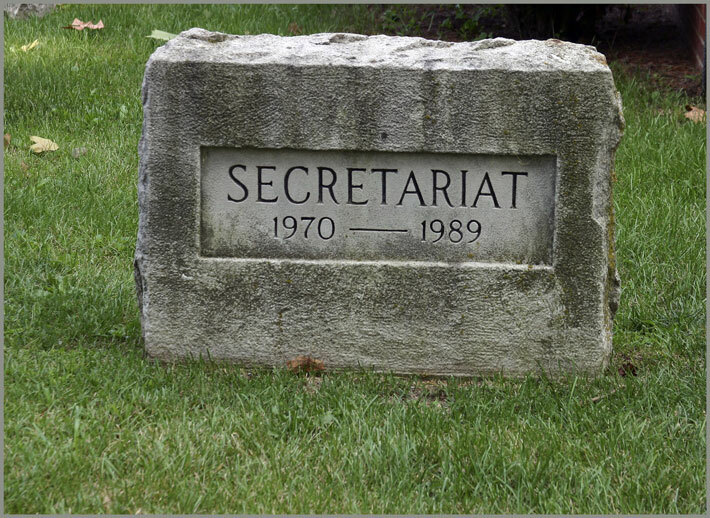 Like Man O' War, Secretariat was buried whole instead of the traditional burial of the head, heart, and hoofs. He lies next to his sire, Bold Ruler, and his grandsire, Nasrullah. A Personal Story: Back on the 20th anniversary of Secretariat's Triple Crown victory in 1993, I was visiting Kentucky Horse Park for the first time and I couldn't believe my good fortune: Penny Chenery, owner of Secretariat and Riva Ridge, was there to meet fans and share Secretariat stories. I told her we'd just driven down the Alaska Highway and I'd been photographing all the animals along the way......in all our trips on the Alcan I'd never seen so much wildlife. Reaching the end of the trip, I realized I should have run out of film with all the shots I'd taken. I opened my camera and found no film. When I told Ms. Chenery of my disappointment at missing all those great animal shots, she told me of a day when she was standing in the pasture when Riva Ridge was brought out to see Secretariat. She said they suddenly reared up and had "a stallion moment." It was an incredible sight and it was the only time she ever saw them greet each other that way. And, she said, she unfortunately had no camera to photograph it. Somehow I didn't feel quite so bad after hearing her story. The greatest and most exciting horse that ever lived. Nice tribute to a great racehorse.